1. Write down a list of their good and bad qualities. This will help you see whether the character is too perfect. Nobody wants to read about someone who can do no wrong. 2. Don’t make all your characters either good or evil. Each person shouldn’t be entirely on one side, just like we, as humans, are not entirely good or completely bad. Those in-between characters are the ones we all try to figure out and attract a lot of attention. What’s unique about your character? It could be their actions or their choice of words. It could be anything! Make up random scenes involving your main characters and try to make their actions and dialogue unique to their personalities. After a couple of days, read it without thinking about the characters. Can you tell that it is your main character speaking or acting in that scene? If not, you need to work on your main character’s personality. 4. Your main characters are important. Make sure your main character is believable and understandable. Your main characters have to possess qualities that are essential to the plot; they need to be some of the strongest characters in the story. They don’t have to be likeable. Sometimes, books are written from the point of view of a bad character. 5. Think about your characters’ ages. If your writing is directed towards a particular age group, consider having your main character’s age around the same level. This makes it easier for readers to relate to. Also, think about the way your characters behave according to their age. You can’t have a 20-year-old filling in a colouring book or a 9-year-old saying, “Back in my day…” Unless, of course, that’s the kind of person they are. 6. Your characters need to develop over the course of your story. Do not reveal too much about your character at the beginning. Instead, give away little bits of information as your plot progresses. 7. Your characters need motives or reasons behind what they do. A villain in particular needs a good motive for what he chose to become. These explanations need to be creative enough to draw your reader’s attention. 8. Make your characters detailed, even if they aren’t mentioned much at first. Each of your characters should be like an intricately woven piece of cloth. Each stitch is carefully planned. As your story progresses, you might need a minor character to become more important. 9. The names of your characters matter. Your primary characters’ names need to be well thought-out. Search for names that mean something related to the character’s personality. For example, you might want to name a gardener’s daughter “Flora.” Another way to pick names is to choose names that are explained later on in the book. For example, a character might name her daughter after a friend who saved her life many years ago. Even if the name of the character isn’t based on their personality, you should still make sure it reflects the setting. For instance, JoJo Kandi is not a name you’d use for a story set in the 1500s. 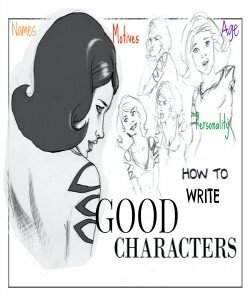 These are just a few tips; there are more ways to create a character. I hope these will help you when you write your characters. Venika Vachani is 11 and lives in the United Arab Emirates. Venika says, “I’m a young writer and reader who’s trying to actually finish a novel (for once! ).” You can read Venika’s winning story from the 2013 Junior Authors Short Story Contest, and read about her recent poetry win at the Emirates Airline Festival of Literature. Is it ever possible to personally contact the authors of the pieces presented on jablog! ? Hi Harriet. You can email me with your question, etc., and I can pass it on to the author.